Turn rotisserie chicken, or leftover turkey into this light and flavorful Healthy Chicken Lettuce Wraps. With pantry ingredients like soy sauce, hoisin sauce and oyster sauce flavoring the chicken, you get an Asian flair that everyone loves. Bright shredded carrots and cabbage, sesame oil and rice wine vinegar make a gorgeous healthy slaw for the wraps. Post may contain affiliate links full disclosure on side bar. 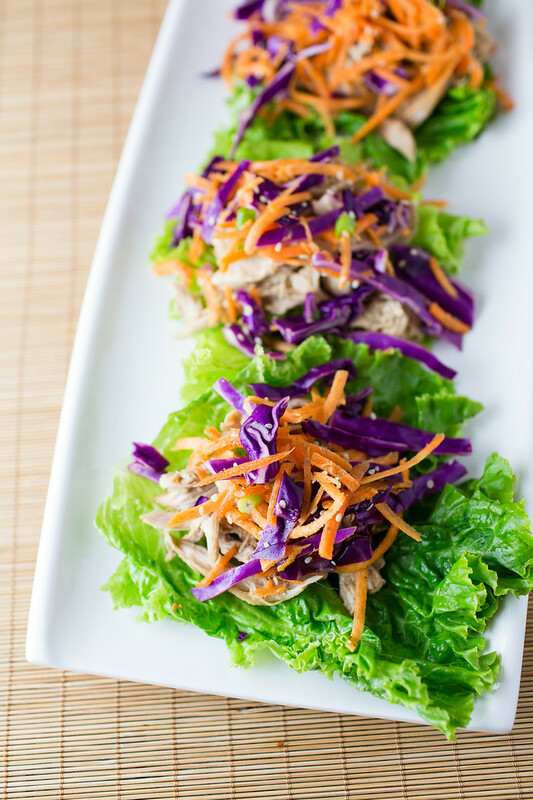 Click here to pin these Healthy Chicken Lettuce Wraps now! 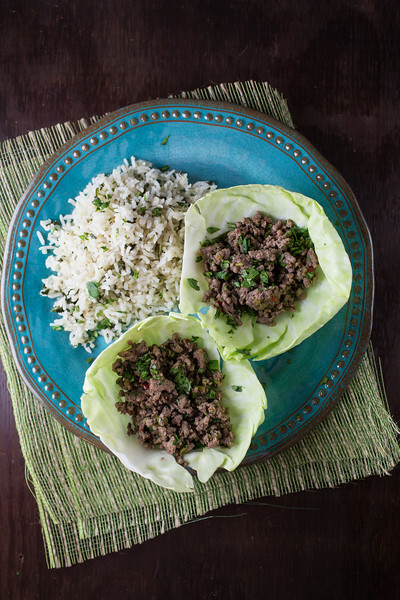 Have you tried lettuce wraps? I admit when I first saw them, I thought, where is the tortilla? Where is the flatbread? I thought they would taste like they were missing something. Mainly carbs, because if there is one thing I love it’s carbs. But guess what? I loved them. They were so fresh and light. The lettuce made the perfect wrap. It allowed all the fresh flavors to shine through. This is one of my favorite ways to use leftover cooked chicken or rotisserie chicken. It is also perfect for Thanksgiving leftover turkey. After all the heavy foods at Thanksgiving, everyone loves this light and healthy wrap. This wrap couldn’t be any simpler to make. You create a sauce of soy sauce, hoisin sauce, oyster sauce, sugar, chicken stock and garlic and heat up the shredded chicken or turkey in that sauce. It is sooo good! While it’s warming up you make a quick vinegar slaw, with gorgeous purple cabbage and bright orange carrots. Your favorite food processor will make quick work of this using the shredding disk. I know that you are supposed to serve lettuce wraps in butter lettuce because they make such perfect cups, but I tend to use whatever lettuce I have in the fridge. I originally found this recipe many years ago on Food52. 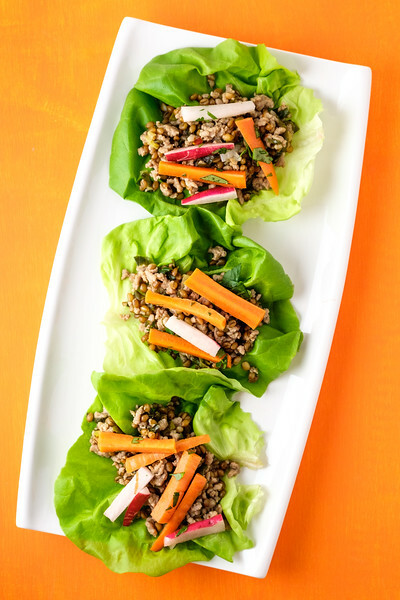 These Instant Pot Pork Lettuce Wraps have whole grains in them! I used cabbage instead of lettuce for these Thai Beef Cabbage Wraps. 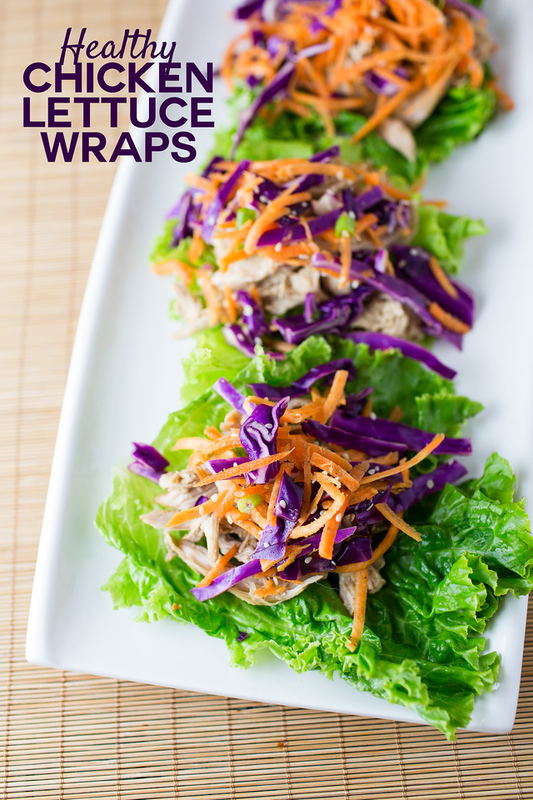 These wraps use leftover chicken or turkey to make a delicious and healthy lettuce wrap. Heat the oil and garlic in a saucepan over medium-low heat, for about 2 minutes. Add the chicken. In a bowl, whisk together the soy sauce, oyster sauce, hoisin sauce, sugar and chicken stock. Pour sauce mixture over chicken and stir to coat. Cook for about 5 minutes to warm up chicken. In a large bowl mix the carrots, cabbage, and green onions with the sesame oil, rice wine vinegar, generous grinds of fresh ground black pepper and a sprinkling of sesame seeds. To make the wraps, divide the chicken evenly between the lettuce leaves. Top with slaw. These would be just the ticket for work day lunch in summer. Such a great Healthy recipe! Love the slaw on top!! Me too, it’s my favorite part! I think I have all the ingredients for this recipe! It looks delicious. It’s so good, you’ll have to let me know if you try it! These wraps look like such a fun lunch from the usual. I need some more healthy recipes to help balance all these upcoming indulgences, so I’m definitely adding these to the rotation! These are perfect after eating heavy over the holidays! This time of year I always have leftover cooked chicken from the crock pot. I love cooking half or whole birds at a time. Going to do this for the next left-over lunch. Any excuse for peanut sauce! I need to start doing my chicken in the slow cooker too! I love lettuce wrap recipes! These are so colorful and they look so tasty. What a great way to use chicken leftovers. I’m always looking for new and healthy leftover recipes so this is perfect! It is one of my favorite ways to use up leftover chicken! I love the filling for your awesome Chicken Lettuce Wraps. Thanks so much for sharing with us at Full Plate Thursday. Have a great weekend and come back soon! Those look really good. I am glad your photography business is doing so well. I may the same issue with spontaneity as you do, Pam! Although I can always be spontaneous when it comes to shoes, or handbags, or jewellery…Love these fresh and delicious lettuce cups. What a lovely, healthy meal. Thank you for sharing them with us at the Hearth and Soul Hop. Thanks Pam – you’ve just solved the dinner question for tonight! It’s been hot here today and we lost the power. A nice easy dish that’s tasty. It looks really good. I’ve been refusing to buy chickens that aren’t at least 6 pounds of late. What’s the point of getting a 3 pound chicken which is 2 pounds of bone? No leftovers, sandwiches, whatever – it barely feeds 2 of my guys! A nice roaster is an easy meal, almost as good as the rotisserie chicken, as you said! Girl, I have never been called spontaneous either. And that is OKAY! I love the slaw on these lettuce wraps. So fresh and tasty!